It's crammed with 200 account managers. They're all wearing pajamas. You're there at the front, in a crisp new Zenga wool-blend. That's what your account manager resume must do. It's got to show you can slay dragons. Grant wishes like you came out of a lamp. It has to prove you can keep clients happier than Robin Williams in his prime. So, how can a resume for an account manager do all that? By showing accomplishments that fit the job description like a Hong Kong tailor. The good news? Anyone can do it. You just need the right map. 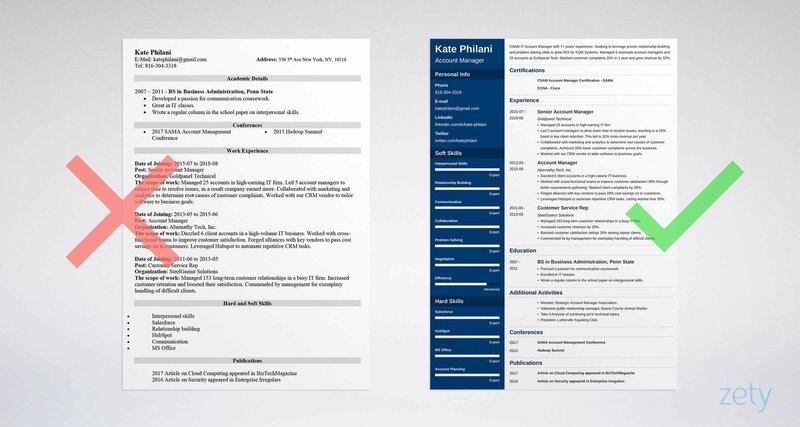 A account manager resume example better than 9 out of 10 other resumes. How to write an account manager resume that lands more interviews. Tips and examples for how to put skills and achievements on an account management resume. How to describe your experience on a resume for an account manager to get any job you want. Here's a sample resume for an account manager made using our resume builder. What's the Best Format for an Account Manager Resume? When you get right down to it, account managers connect. So, your account management resume must do that right away. By using the right account manager resume format. The reverse-chronological resume layout sends the message fast. It puts your most recent successes first. That's ideal, because the average hiring manager skims each resume in just six seconds. Want to put yours in the David Ogilvy zone? 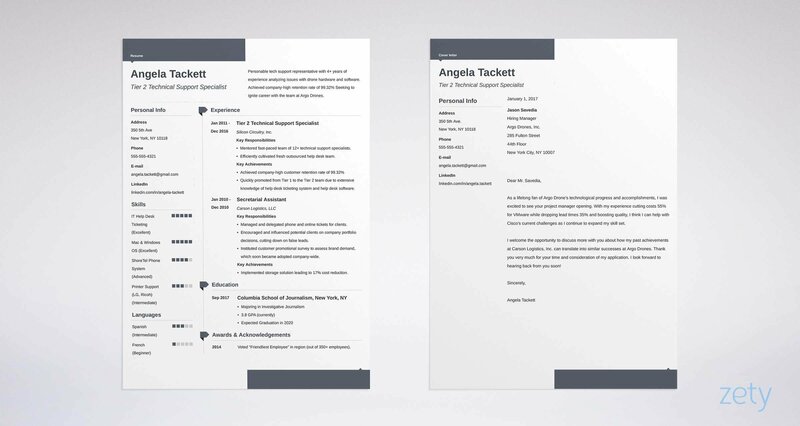 Add perks like the best resume fonts and strategic white space. Include generous headings to keep your message crisp. Last, should you send a PDF or MS Word resume? Applicant Tracking Software used to skip old-style PDFs. Modern PDFs are machine readable. So, send a key account manager resume PDF unless the ad says not to. Pro Tip: Switching careers from customer service or sales? Use the combination resume format. It'll help you show key achievements from non-account-manager jobs. Imagine the juiciest account manager job on Earth. It's got stock options. Full dental and medical. An expense account so plush you could play golf on it. Between you and that job sits a hiring manager named Alan. He's busy. He's got 30 clients climbing up his chair legs and a to do list like War and Peace. Meanwhile, your account manager resume is buried in a pile of others on his desk. Get his attention with a resume summary or a resume objective. A resume summary shows accomplishments. Use it if you've got more experience than Roger Sterling from Mad Men. A resume objective shows your passion. It works best for rookies and career changers. Stuff either with enough achievements to make Billy Mays say, "Wow!" Enthusiastic account manager seeks new position. Skilled in building relationships, Salesforce, and communication. I think my 7 years of experience give me a solid footing to grow your customer base. That's not Willy-Loman-bad, but it won't haul in a pile of interviews. CSAM IT Account Manager with 7+ years' experience. Seeking to leverage proven relationship-building and problem-solving skills to grow ROI for KQM Systems. Managed 5 associate account managers and 25 accounts at Goldpanel Tech. Slashed customer complaints 20% in 1 year and grew revenue by 32%. That's whalebait. Remember our hiring manager, Alan? If he's not looking for your contact info, he's got issues. Are you a junior account manager with no experience? Passionate junior account manager. Will take entry-level job. I haven't yet held an account manager title, but I'm very skilled in communication, collaboration, and problem solving. That reads like a cleaned-out desk. Energetic account manager, aiming to raise customer retention for Abernathy Tech. As a customer rep at SteelGamut Solutions, boosted retention 25% through attention to client needs. Commended 5 times by management for skill at handling difficult clients. Pow. Don Draper's in the house, and he'll soon be sleeping on a bed made out of money. Where did a fledgeling account manager find experience like that? I'll show you the steps next. Pro Tip: Write your sales account management resume summary or objective last. That'll give you plenty of accomplishments to pick from. Let's get back to our hiring manager, Alan. As he gently bounces on his yoga ball, he has one question: Can you make his clients happy? Answer "yes" with your experience. List your most recent job first. Add 3-5 achievements that fit the job description like a key account fits revenue creation. Managed 25 accounts in high-earning IT firm. Led 5 account managers to drive down time to resolve issues, resulting in a 15% boost in key client retention. This led to 32% more revenue per year. Collaborated with marketing and analytics to determine root causes of customer complaints. Achieved 20% lower customer complaints across the business. Nice. The hiring manager just dropped his copy of The Trusted Advisor. Your technical account management resume just blew his gold toe socks off. Managed multiple accounts for an IT firm. Tasked with resolving issues in a timely fashion. In charge of reaching client retention goals. Collaborated with marketing and analytics to resolve customer complaints. That's like an empty client account list. All hope and no delivery. A strategic resume for an account manager has to show achievements. But what if your resume is in the no work experience zone? See the two customer account manager resume examples below. If you don't have experience, can you still write a great resume for account management? Well, what does an account manager do? She builds relationships, serves customers, and does a little project management. So, even if you've never held an account manager title, add achievements in those areas. For instance, see the entry-level account management resume examples below. Account Manager Experience: Haven't held the title yet, but I'm a rapid learner. Feels phoned-in, doesn't it? How would you judge that applicant at serving clients? Managed 153 long-term customer relationships in a busy IT firm. Increased customer retention by 25% across my client list. Boosted customer satisfaction ratings 30% among repeat clients. Commended 5x by management for exemplary handling of difficult clients. That's an account management resume Dale Carnegie could love. Yet the applicant has never been an account manager. She just found account manager responsibilities from past non-account-manager jobs. With a little digging, you can write bullet points like those right now. Pro Tip: Are you fresh out of school? Stuff your resume for account management with academic achievements. Those can include fellowships or just kudos from professors. For account managers, experience is everything. But your educations section is key real estate. Then add accomplishments that show you fully understand the job. These two sample account manager resume sections are vastly different. Yet both target a job requiring communication, marketing, and interpersonal skills. Pursued a passion for communication coursework. Wrote a regular column in the school paper on interpersonal skills. Wow. The hiring manager feels like he's known you all his life. Completed all core business coursework. That's the account management resume equivalent of, "I'm sorry, I forgot your name." But add details, and you're speaking the hiring manager's language again. Pro Tip: Do you need a bachelor's degree on a resume for account management? In most cases, an associate's degree plus experience works just as well. Remember our hiring manager, Alan? He wants to know if you can walk the talk. Prove it in your account manager resume bullet points. They should tie you to the job like repeat business to ROI. Our next national account manager resume examples fit a job that wants requirements gathering, relationship building, and HubSpot skills. Huh. That applicant has every skill since the invention of the wheel. She should have focused on the ones shown in the account manager job description. Dazzled 6 client accounts in a high-volume IT business. Worked with cross-functional teams to improve customer satisfaction 35% through better requirements gathering. Slashed client complaints by 28%. Forged alliances with key vendors to pass 20% cost savings on to customers. Leveraged Hubspot to automate repetitive CRM tasks, cutting wasted time 30%. Wow, right? You can almost hear your Lifetime Value getting bigger. Use the sample account manager resume skills list below to get your resume off and running. The account management skills below aren't comprehensive. They all make great account manager resume keywords, but don't use them all at once. Plus, seek more in job offers online. Use the strategy above with your insurance or advertising account management resume. You'll look like Jerry MaGuire, back on the job hunt. All the hiring manager wants is experience and education, right? A great account manager resume shows so much more. It proves you're all the best parts of Spock and Ron Popeil, not to mention J.A.R.V.I.S. How? By showing "other" achievements that stand out like a 99% margin. See how that's done in the next two technical account management resume examples. Hey, more power to you, but do those interests make you a great account manager? Member, Strategic Account Manager Association. Volunteer public relationship manager, Boone County Animal Shelter. Take 6 hrs/year of continuing ed in technical topics. The hiring manager will knock down his bronze bust of Tommy Boy to get to your contact info. But with a little digging, you can probably write a resume for an account manager like that. Pro Tip: Do you need a certification on a resume? Senior applicants don't need them. Still, they look great on an entry-level account manager resume. How About a Cover Letter for an Account Manager? Everybody "knows" you don't need a cover letter. That's why you'll get the interview, while "everybody" is still waiting for the phone to ring. Most account manager cover letters are too generic. That's all it takes to start a cover letter, and then sew it up. I'd love to work for a team that puts clients first like KQM. Your Customer Relationship Management Excellence Award win in 2017 was well-deserved. 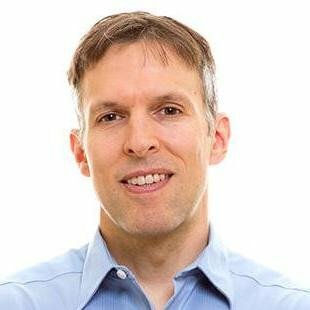 I boosted key client retention 15% at Goldpanel Tech, and grew revenue by 32%. I firmly believe the interpersonal and problem solving skills that got me there would serve KQM's needs exceptionally well. End your cover letter with a request. Try, "Could we discuss growing KQM's revenue by 25% in the coming year?" Pro Tip: What's the most powerful way to keep your clients happy? Become an authority in your industry. That means classes, trade shows, networking, and publishing. As luck would have it, all look great on an account manager resume. Adding contact info to an account manager resume is easy, isn't it? But to land a fat key account manager salary, add your LinkedIn address too. In 2018, 87% of hiring managers hire from LinkedIn. Plus, a LinkedIn profile adds a personal touch. That's key in a field where "personal" is everything. Pro Tip: Add plenty of account manager resume keywords to your LinkedIn profile. Learn how in our guide to optimizing LinkedIn profiles. The best account manager resumes focus on achievements. List relationships you've built and other metrics you've improved. Link your account management resume to the job description like a key client to a direct phone line. Do that with accomplishments that match the job description. Use "other" sections to show you're more than just a sheet of paper. Fill them with certifications, publications, and association memberships. Do you have questions on how to write a great resume for an account manager? Not sure how to describe your skills or achievements? Give us a shout in the comments! Let's start the conversation.